Thomas Douglas has proven to a great social media expert for our great company, he provided communications support to the Reeds Gumtree Books since 2010. He is the media contact and manager for all our social media platform and answer all sponsorship requests. 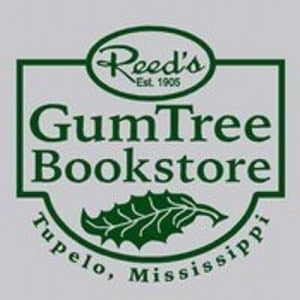 Reed’s Gum Tree Bookstore is where readers and writers meet in Downtown Tupelo, Mississippi. Business hours are 9:30-5:30, Monday-Saturday. Our emphasis is on Southern Writers: John Grisham, Willie Morris, Greg Iles, Shelby Foote, Barry Hannah, Fannie Flagg, Larry Brown, Bobbie Ann Mason, William Ferris, Ellen Douglas, Ann Patchett, Tom Franklin, John Armistead, Sela Ward, and many others. We have many signed first edition books including works by John Grisham. We are proud to now offer Google e-Books that are compatible with any device (e-readers including the Nook and Sony Reader, iPads, smartphones, laptops, tablets) EXCEPT the Kindle (although a loophole has been found for the Kindle Fire). Our prices are competitive with Amazon, so we hope you’ll choose an independent bookstore for your e-book purchases, even if it isn’t ours. We thank you for your support over the past 106 years, and we’re looking forward to the future! Gum Tree Bookstore in Tupelo MS.